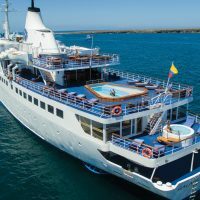 This eight day itinerary includes visits to San Cristobal, Genovesa, Santa Cruz, Isabela, Fernandina and Santiago Galapagos Islands. 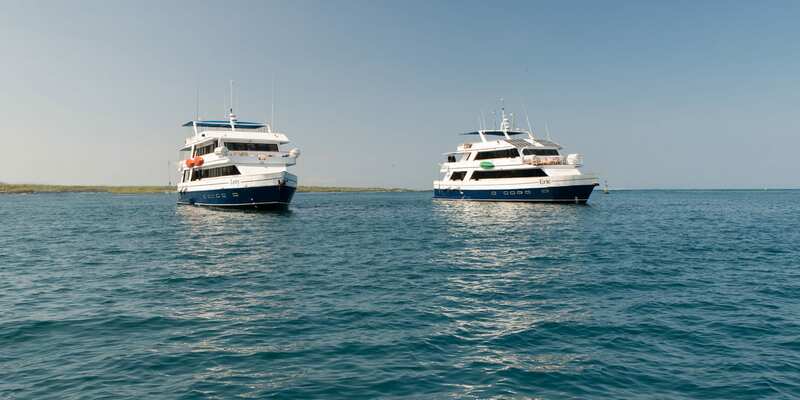 Eric & Letty are two identical First Class yachts offering exciting signature liveaboard cruises in the Galapagos. Custom built in 1994 and refurbished annually, MY Eric and Letty accommodate up to 20 guests per boat in 10 air-conditioned cabins. 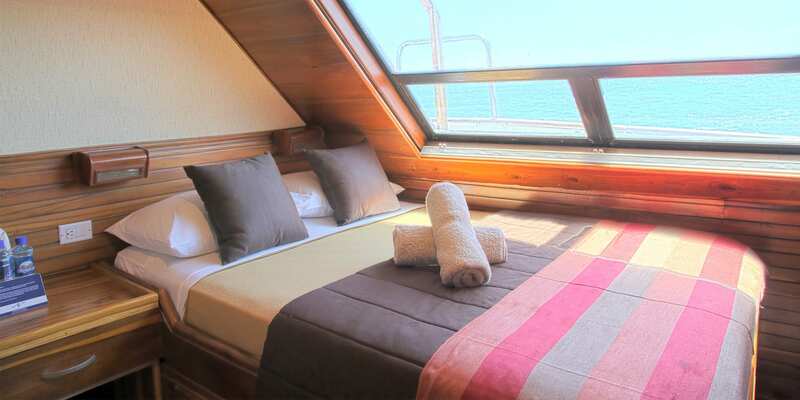 Each spacious cabin features either one double or two single beds with en-suite bathrooms. 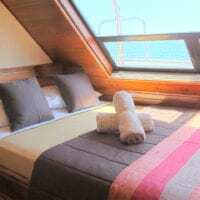 All cabins are outside-facing with sea-views through either a porthole or window. 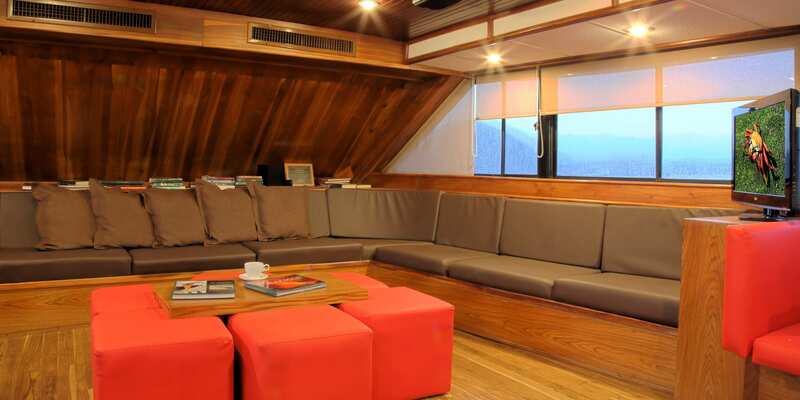 Social areas include an indoor lounge/conference area with flatscreen TV, library, dining room and fully-stocked bar all with panoramic views. 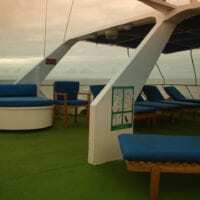 For relaxation guests can lounge on the partially shaded sun deck whilst enjoying the sea breeze and stunning views or the wildlife observation areas. Delicious and varied meals are served throughout the day, and house wine and local beer is complimentary during dinner. 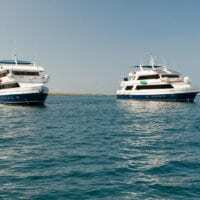 Your Galapagos Cruise include: Accommodation in selected cabin, all meals, Island sightseeing, Naturalist guides and lecture services in English, Snorkelling gear, shared transfers in the islands and from main hotels in Quito and Guayaquil. Please remember that the exact route and program may vary according to weather and ocean conditions and the wildlife you will encounter. Fly to Puerto Baquerizo Moreno on San Cristobal Island, and transfer by bus to the main dock and then by Zodiac to your vessel anchored in the bay. After a welcome briefing and safety drill, a delicious buffet lunch is served on board. In the afternoon, travel by bus to Cerro Colorado to visit Centro de Crianza Jacinto Gordillo (La Galapaguera) where the National Park has established a breeding program for giant tortoises in their natural habitat. At the visitor center, Learn about the origin and evolution of tortoises, as well as threats by introduced animals. Along the trail, watch for the San Cristobal mockingbird and Calandrinia plant, both endemic to this island. Return to the yacht for a briefing followed by the Captain’s welcome cocktail party and dinner prepared by our chefs. In the morning, you’ll land at Prince Philip’s Steps, Genovesa (TOWER) Island is one of the most spectacular places in Galapagos for bird watching because of its diversity of species. Throughout the day, you’ll want to have your camera ready. 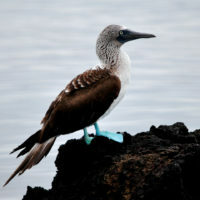 Your guides will point out red-footed boobies nesting in palo santo trees, Nazca boobies nesting near the trail, and storm petrels gathering in large numbers in an open lava field. With luck, you may even get to see the elusive short-eared owl. 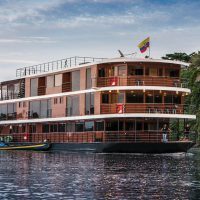 After a BBQ lunch on the yacht’s sun deck and a demonstration on how to make Ecuadorian ceviche, you’ll have the option to explore the cliffs up close, either by kayak or stand-up paddleboard, or on a deep-water snorkeling excursion from the Zodiac. Look for the red-billed tropic bird hiding in the crevices of the rock. Later in the afternoon, you’ll land at Darwin Bay, a gorgeous coral sand beach. Here, you’ll see both swallow-tailed gulls and lava gulls gathered near the tide pools. A forest of Optuntia cactus and mangroves provide shelter for Great frigate birds. Males looking to attract a mate inflate a red pouch on their chests. Round out the afternoon by relaxing on the beach, or choose to swim with friendly, playful sea lions in these warmer northern waters. 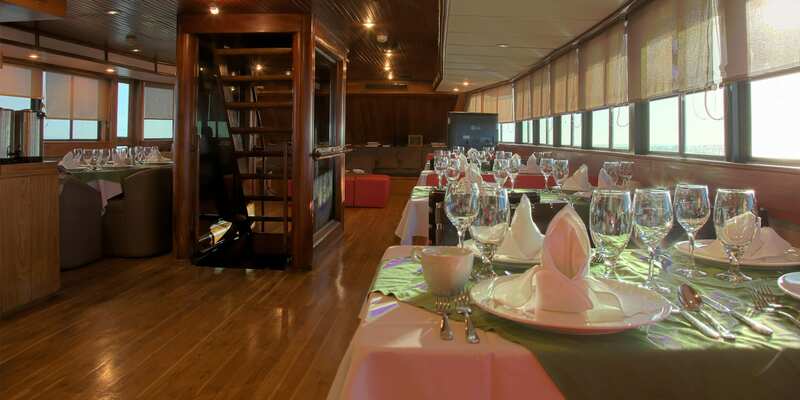 When you return to the yacht, you’ll have a short briefing followed by a delicious dinner. 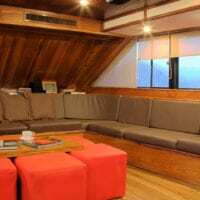 If the night is clear, take a stroll on the deck and enjoy the sky full of bright stars. Your guides can point out constellations and help you identify the species of birds flying alongside the yacht. This morning you’ll visit Las Bachas, on the northern side of Santa Cruz. Dozens of bright pink flamingos feed on the interior lagoons, and a long white sand beach is a beautiful site for a stroll. 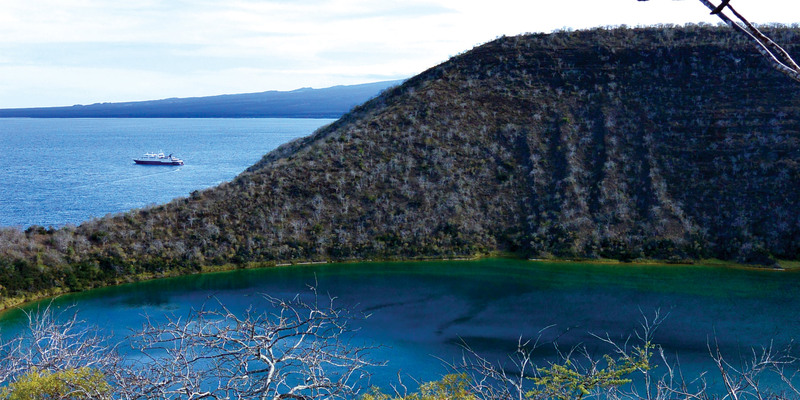 Your guides will point out endemic plant species and share some fascinating Galapagos history. Before returning to the yacht for lunch, you’ll have time to snorkel from the beach. Bring your underwater camera to take photos of colorful tropical fish and sea stars, along with sea turtles and maybe even sharks along the ocean floor. Your guide will offer an enrichment lecture that is informative and entertaining, the topic is on marine currents, climate and geology of the Islands. In the afternoon, when you step ashore on Cerro Dragon you’ll have a magnificent panoramic view of the bay and island landscape. You may see flamingos in the brackish lagoon, along with a variety of plants, including opuntia cactus, Palo Santo and Muyuyo trees (Cordia letea). As you walk the trail, look for Darwin’s finches, Galapagos flycatchers, yellow warblers, and Audubon shearwaters. The guides will also pause to point out birds such as stilts, pintail ducks and sandpipers. Scan the path for yellow Land iguanas, strikingly different from their marine cousins, resting in the sun. These iguanas, which are endemic to the Galapagos, were once part of the Station’s breeding program. 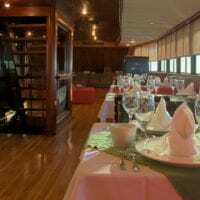 After walking the trail, you’ll return to the yacht for a briefing and dinner. 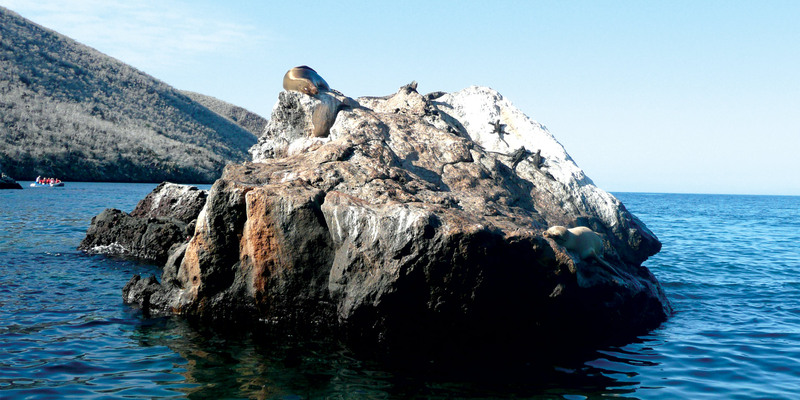 Begin your morning with a Zodiac ride at Punta Vicente Roca. Your skilled driver will navigate you through the wave-sculpted caves and bring you up close to the tuff walls covered in colorful Sally light-foot crabs. Don’t miss the opportunity to snorkel here (2), with penguins diving playfully in the water or grooming themselves on rock formations. Look for sea turtles poking their heads above water before swimming gracefully beneath the surface. After lunch, take a seat on the sun deck to enjoy the scenery as we sail through the Bolivar Chanel. In addition to the dramatic scenery, you might get to see whales riding the bow wave or dolphins jumping in graceful arcs. You may even spot the Mola-Mola, an odd-looking giant sun fish with triangular fins on the top and bottom and a short, stubbly tail fin. 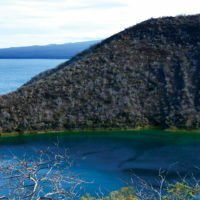 In the afternoon, you’ll disembark at Urbina Bay and see some surprising evidence of volcanic activity. Four files of coastal seabed were exposed due to a dramatic uplift during an eruption in 1954, and some of the remaining coral skeletons still stand several feet high. 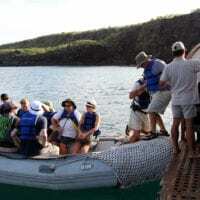 A diverse collection of animal species await on the island as well, including Galapagos land iguanas, marine iguanas, Darwin’s finches, brown pelicans, flightless cormorants, and the occasional giant Galapagos tortoise. When you’re finished exploring, you’ll return to the vessel for your nightly briefing and dinner. After dessert, step outside and observe the pale glow of the Milky Way. As we cross the Equator, you may get a visit from King Neptune himself! Guests of all ages will enjoy this fun filled evening and maritime ritual, our crew dress as pirates and guest participation is optional. This morning you’re in for another geological wonder. 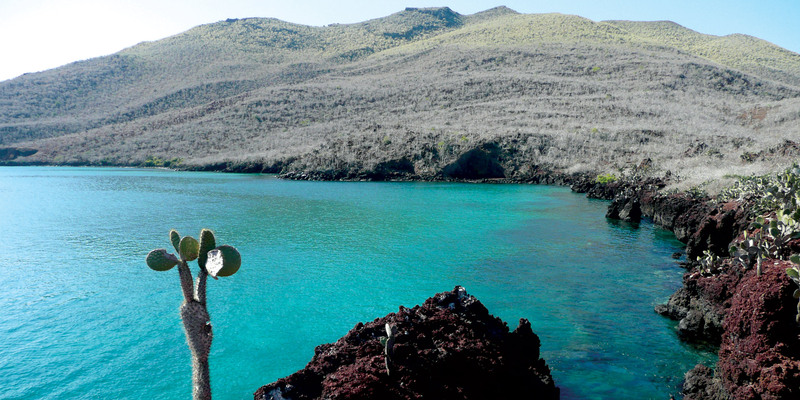 Stop at Punta Espinoza, the youngest and most pristine Island in Galapagos, formed by active volcanoes that stretch around the coast. With no introduced animals on this island, you can observe the ecosystem at its most pristine. Sea lion harems lie on the beach, with resident bulls carefully guarding their territory and keeping a lookout for sharks that threaten the colony’s pups. Hundreds of marine iguanas, forming the largest colony in Galapagos, warm themselves along the rugged shoreline, blending in with the dark rocks. Out on the point, your guide will show you the nests of flightless cormorants, which stay close to shore since they lost their ability to fly. 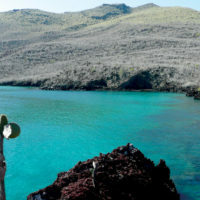 You’ll have an opportunity to snorkel here, in the company of the large sea turtles that frequent the area. Return to the yacht for a BBQ lunch served on the sundeck where you’ll have a prime view for whale watching. 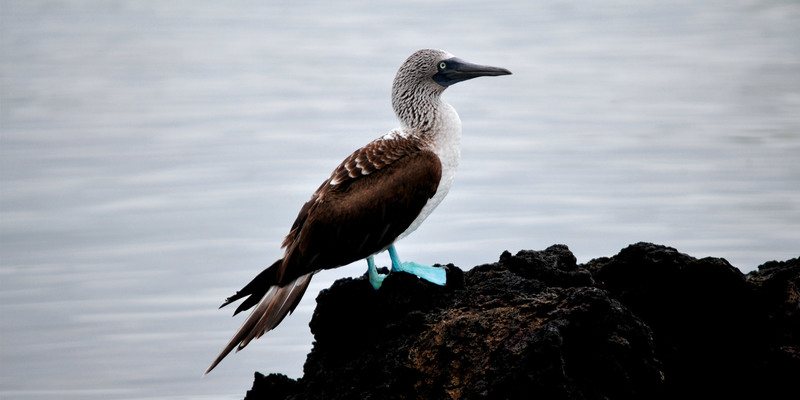 Your guide will offer an enrichment lecture about Charles Darwin and his Theory of evolution as well as social/environmental projects that benefit the Galapagos. 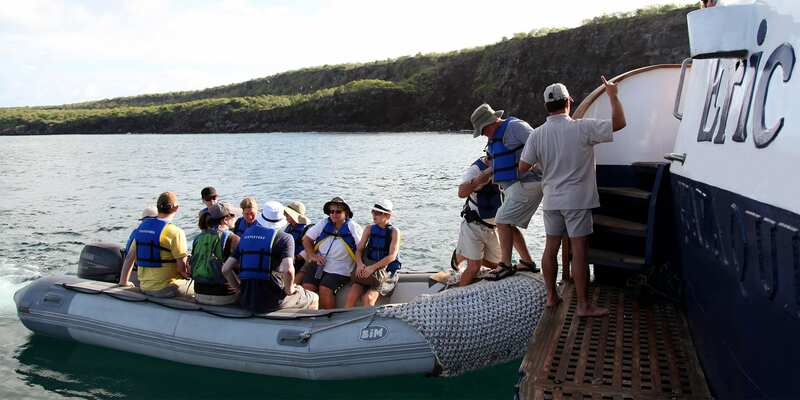 After lunch, you’ll get to see some of the human history of the Galapagos when you go ashore on Tagus Cove. This was a favourite stopping point for pirates and whalers for centuries, and sections of the rocky cliffs are covered in graffiti from as far back as the 1800s. Hike at a faster pace to a saltwater lagoon and scenic overview, and take in the ocean, lava fields, and volcanic formations. You may choose to explore the shoreline of the secluded cove by kayak or paddleboard. 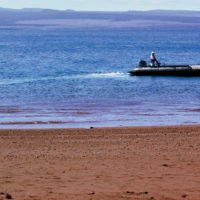 There are many animals to see, including Galapagos penguins, boobies, pelicans and other seabirds. Tonight, as we sail toward the geographic centre of the archipelago, we’ll cross the equator for the third and final time. 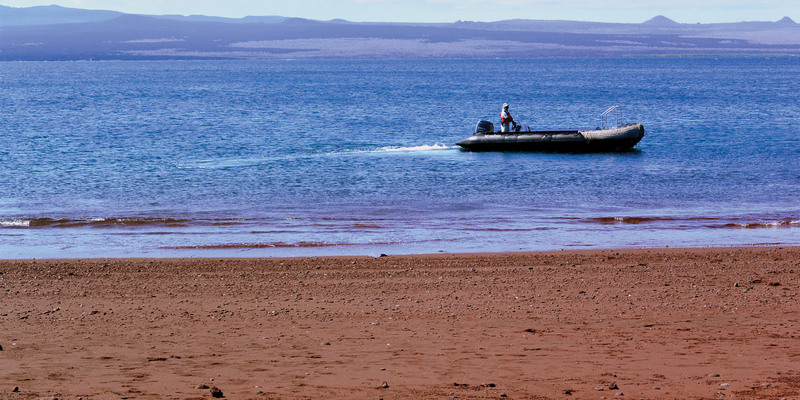 This morning, you’ll disembark on the dark red beach of Rabida. 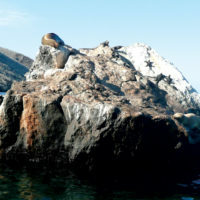 This small island is considered the geographic center of the Galapagos because its volcanic rocks are the most diversified in the archipelago. A short trail will lead you to a saltwater lagoon filled with greater flamingos. Along the way, look for marine iguanas, mockingbirds and yellow warblers. You may also see Darwin’s finches. Over a dozen species of finches live on the islands and observing them contributed to Charles Darwin’s ideas that formed the basis for his theory of evolution. If you choose to snorkel this morning (2), you may be able to see a colony of sea lions or rays. Several species of rays live on the Galapagos, but golden rays and spotted eagle rays are the most common. This afternoon visit Puerto Egas, where you’ll stroll along the shoreline looking for octopus, starfish and other sea life caught in the tide pools. 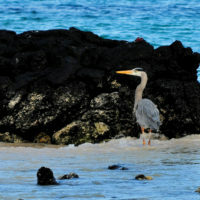 Watch for great blue herons, lava herons, American oystercatchers and yellow-crowned night herons. 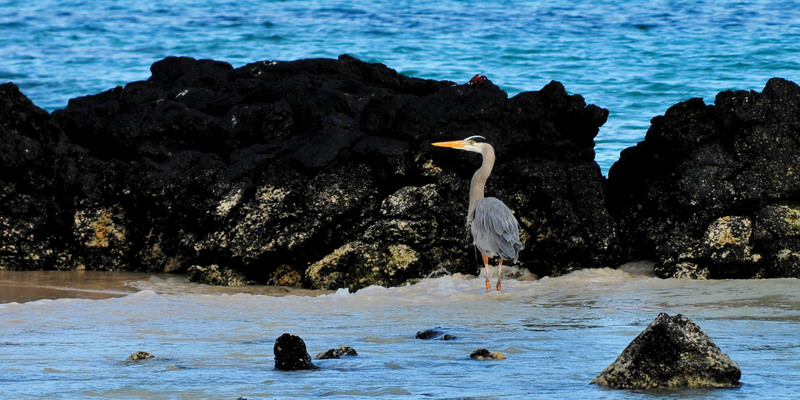 At low tide, catch a glimpse of marine iguanas as they feed on exposed green algae. During mating season, green and red algae give the usually black marine iguanas beautiful coloration. The walk ends at the grottos, deep pools of clear water where you’ll encounter fur sea lions once on the verge of extinction. Before returning to the yacht, take the opportunity to snorkel from the beach (1). 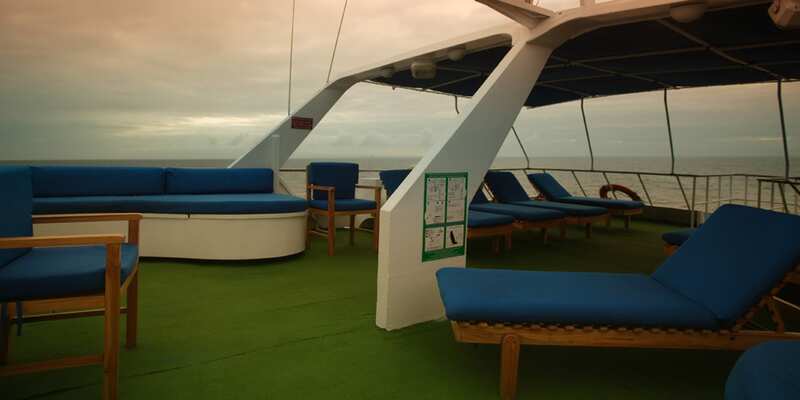 As you sail after lunch, take a seat on deck to view the dramatic landscape and dolphins that are often spotted here. This morning, we visit the breeding center Centro de Crianza Fausto Llerena and Charles Darwin Research Station where we learn about ongoing conservation efforts from exhibits set up along the wooden trail. 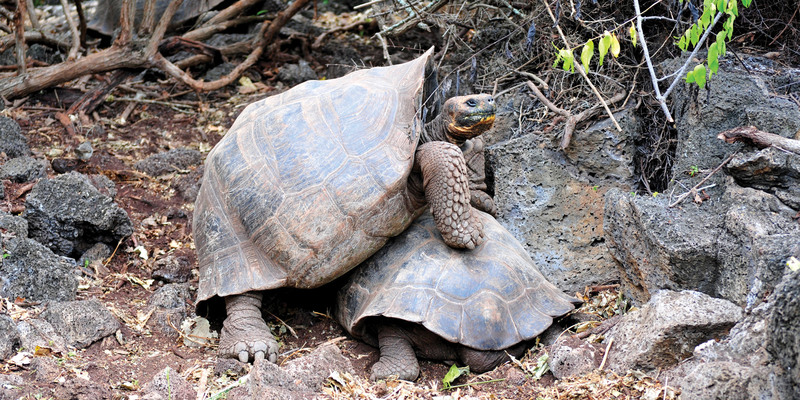 You’ll see hatchlings and miniature tortoises that will be repatriated by the National Park when grown. 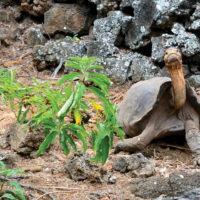 The newest exhibit honours Lonesome George, the last surviving tortoise from Pinta Island that tragically died of natural causes. 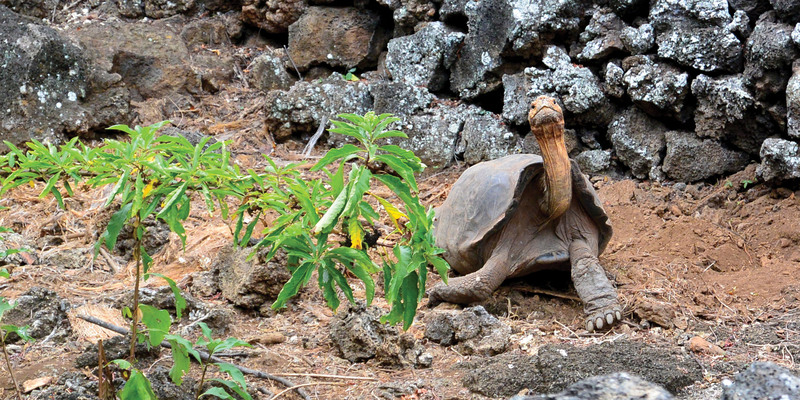 With his species now extinct, Lonesome George has become a worldwide icon, emphasising the importance of efforts to preserve and protect endangered wildlife. A more hopeful story is Diego, a saddleback tortoise whose species was reduced to 14 individuals before he was transported from the San Diego Zoo and who has since fathered hundreds of descendants. Afterwards, you’ll learn about the history of the settlers of this Island on a guided tour through the back streets of Puerto Ayora. Stroll through town to shop for handmade souvenirs, Ecuadorian chocolate ice cream or coffee grown in Galapagos. Return to the yacht for lunch and later board a bus for a short ride to a lava tunnel, a hollow formation created when lava on the earth’s surface cools and hardens while molten lava continues to flow in the middle. Your next stop will be Los Gemelos (The Twins), a pair of large, deep craters with vibrant plant life at higher elevation. 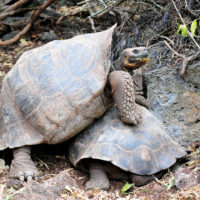 Next stop is at a privately-owned hacienda, where giant tortoises roam freely – some weighing over 500 pounds – in their natural habitat, feeding or resting in shallow pools. Return to the yacht for dinner or, if you wish, remain ashore on your own at a local restaurant. Your guides or concierge will be glad to provide a recommendation. Zodiac shuttles from the yachts to the main dock will be offered throughout the evening for your convenience. After breakfast, travel by bus to the Interpretation Center on San Cristobal Island to gain a more complete understanding of the natural and human history of the Islands. Afterwards, spend time in port before heading to the airport for our flight back to the mainland.